Ocean Blue is pleased to offer manufacturers a Near Turn Key (NTK) solution for the low-cost PayTV Zapper, and PVR markets. Optimised for low-cost platforms, with minimal resource requirements, the NTK provide manufacturers with a ready-to-go solution that can be readily customised to the end market requirements. The NTK compromises of OBS’ market-proven Sunrise DVB stack, pre-integrated with a UI framework, and standard hooks for the integration of conditional access modules for the Pay-TV market. A reference UI implementation is also available or manufacturers are free to develop their own using a 3rd party, commercially available, drag n drop tool. The NTK is suited to both Linux and RTOS based systems. Figure 1: NTK Zapper Software Architecture. Sunrise is OBS’ market-proven DVB stack, which has been deployed in millions of devices worldwide. It encompasses all the components required to provide clients with digital TV on a set-top box or television. 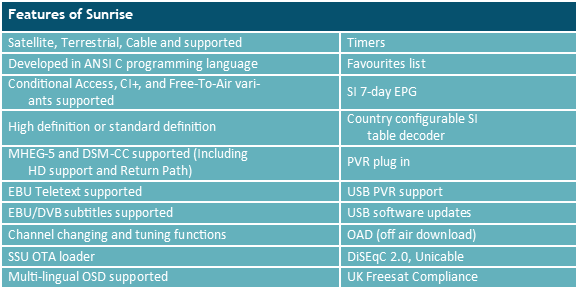 Developed to be standards compliant (DVB, D-book, Nordig) and written in ANSI C programming language, Sunrise is modular, hardware agnostic and comprises all the elements needed for digital TV devices. Features of Sunrise. Sunrise supports satellite, terrestrial and cable, it is developed in ANSI C programming language and has conditional access, Ci+, and free to air variants are also supported. It can be watched in high definition or standard definition. 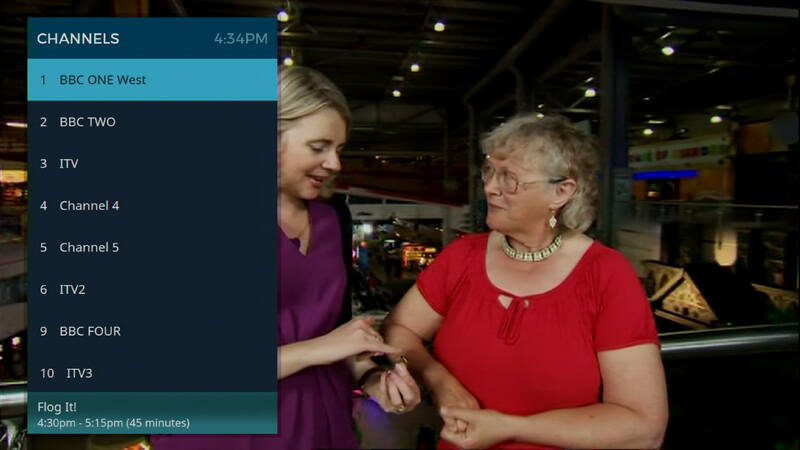 Sunrise also supports MHEG-5 and DSM-CC are also supported, along with EBU teletext, EBU/DVB subtitles, channel changing and tuning functions, SSU OTA loader and multi lingual OSB are supported. Sunrise supports DVB-S/S2, DVB-T/T2 and DVB-C digital TV (either in isolation or as a combination) as well has having defined interfaces for Conditional Access and CI Plus modules. The NTK employs a flexible user interface framework that is designed to generate a compact, small footprint UI for low end platforms, whilst still offering the user a compelling experience. OBS provides a reference UI implementation, which the manufacturer is free to customise to their requirements, or OBS can provide any necessary customisation services. The manufacturer can also implement their own UI using a commercially available 3rd party tool for the PC. Being PC based it is easy to prototype UI designs via a drag ‘n’ drop interface, and when you are happy with the design, transfer it to the target platform. The NTK is designed to require minimal system resources and is ideal for RTOS, or low footprint Linux based systems. The exact requirements will vary with the OS, numbers of channels/events in the programme guide, and complexity of the UI assets. The table below provides a general indication of the platform resources required for the NTK.